The following guide is the property of Pursell Manufacturing and is not to be copied, republished, or redistributed. The following is a summary of suggestions we have gathered over the years from Christmas tree retailers. While this short summary is by no means comprehensive, it should provide you with things to consider when establishing a seasonal Christmas tree business. 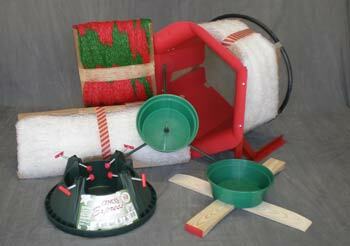 There is more than one way to skin a cat, just like there are more ways than one to sell Christmas trees, but please consider the following advice.Pursell Mfg. 1. Are you financially capable of running a business? 2. What retail-business experience do you have? 3. Can you find a good location with power and water available? 4. Do you have the time and man-power? 5. What is the supply/demand and competition in your area? Many established businesses such as Garden Centers and Hardware Stores are a good fit to sell Christmas trees since they already have an established location and clientele. Many established businesses choose to sell Christmas trees in order to keep business operating through the winter months or attract customers to existing products inside a store. However, if you want to start a temporary business just selling Christmas trees, please consider the following vital ingredients to running a successful Christmas tree business. Your first order of business when selecting a location is to study the demographics of the area. Consider the population, per capita income, what type of residence (apartment, house, mobile home, dorms), type of people (single, married, married with children), ethnic backgrounds (does the population celebrate Christmas?). The second order of business when selecting a location is whether or not you can obtain a business license from the city. Next, you will want to find a location with high exposure to traffic and plenty of parking, corner lots near traffic signals or stop signs are preferable. Be aware of the difference in commuter traffic and shopping traffic. Most people decide to purchase a Christmas Tree when they are shopping. A location next to a “shopping” area may be critical. Make sure that your lot and signage can be seen from at least 200-300 feet away in 2 directions. Make sure there is easy access and ample parking available. Thirdly, consider the size of the lot. The actual sales area should be able to accommodate the display of 1/6 of the total number of trees you plan to sell (e.g. if you plan on selling 600 trees, you will need to display 100 at a time). The location should have adequate power and water supply. Pursell Manufacturing will supply you with all the material necessary to set up your lot, but first, find a supply of Christmas Trees from a reliable farm or wholesaler. Your area of the country should play a good part in choosing a farm. Find out what species of trees sell well and are compatible in your area of the country. Consider these things when purchasing trees, a good tree farm or wholesaler should help you: What varieties should you sell, What sizes, what grade of tree, price per foot for Pursell Mfg various species, delivery date. Your lot should have an entrance, sales area, exit near the register, and a storage area. On smaller retail locations the entrance and exits are usually the same. Remember that you are selling “Christmas Trees”, not just trees. Each tree should be open and displayed on a stand in water. The customer wants to see what the full tree looks like so they can visualize what it will look like in their home. DO NOT SELL TREES LIKE PRODUCE BUNDLED UP LEANING AGAINST A WALL OR IN A PILE. 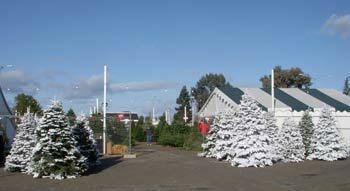 Arrange the most expensive and glamorous trees near the entrance (large trees, flocked trees, or pre-decorated trees). Display the least expensive inventory near the back or far side of the lot (small trees, lower grade, or less expensive species). 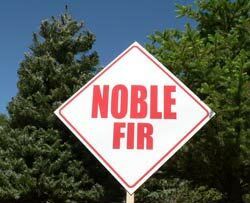 Make sure you have adequate signs showing the size and species of each group of trees (Noble Fir, Fraser Fir, Douglas Fir, etc). Allow approximately 25-40 square feet per tree to allow ample aisles and navigation through the sales area. Price each tree so customers can compare and select the Christmas tree they want to bring home. Remember, every tree must have a stand, so make sure you provide stands or preferably a stand installing service. 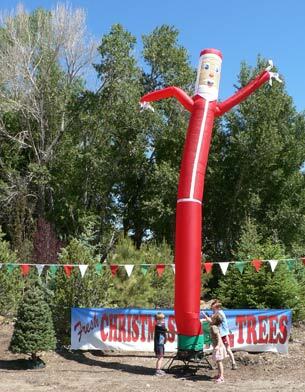 It is very important to stand large heavy trees, as very few retailers carry stands for large trees. Many people pass by a large tree simply because they have no way to stand a tree of that size. However, if it is pre-stood, they can imagine taking that tree and placing it directly into their home. Many customers already have a stand but find it easier to purchase a tree with a stand installed at the lot; they will pay more money for the simple convenience. See our stand guide for more information on selecting stands for display and resale. Read the Tree Stand Guide by clicking here. Up sell items such as stands, wreaths, tree preservative, tree bags, mistletoe, etc. should be displayed near or next to the cash register. These are usually impulse items that customers did not know they needed until they see them. Up sell items are important ways to make a profit, usually doubling your money. Imagine if you could make just $2 more on every tree you sell. If you sell 1000 trees, that’s $2000 more dollars in your pocket. If you choose to net your trees, this service should be provided near the exit and loading area. Offer methods to tie trees to tops of cars such as the Christmas Tree Lock, twine, or Snappy Trunk ties. Often charity groups can be used to provide this service for tips. The storage area should be placed out of the normal traffic area of the lot in a cool, shaded area. The most important part of promoting your lot is the actual lot itself. The more flash, movement, color, and activity the more you will attract customers. Use color banners, pennants, sky guys, and play music. Make sure you can be seen from a drivePursell Mfg-by 300 feet away. The more fun your location looks the more people will be attracted. Hang “Christmas Tree” banners weeks before trees arrive and build the hype around your location that trees will be available soon. It is very important to have adequate lighting. Most of your sales will be in the evening hours and on weekends. If your lot is not well lit, it will look dingy and scary. Think of a car lot, there is a reason why they use lots of lights. Dress comfortably but nice. You are working but you have to look presentable to customers at the same time. 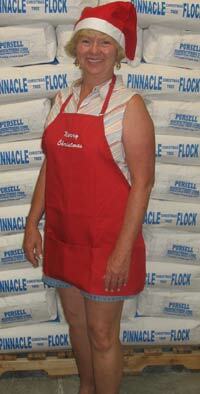 Wear Santa Hats or aprons so customers can easily identify employees and know who to ask for help. Play Christmas music to create a festive atmosphere. Have activities for kids such as coloring books. Another feature to give away popcorn and hot chocolate. The goal is to make a fun and festive atmosphere for families. Greet customers as they enter your location, and provide customer service such as help loading trees. Remain open during peak holiday shopping hours and after dinner when families return home from going out to eat. Remember, enthusiasm creates enthusiasm. If you and your employees are smiling and having fun, others will have fun and make you part of their Christmas for years to come. They will in turn tell their friends and families and your business will grow year after year. Other things to consider: direct mail, newspaper advertising, drawings for give-aways, partnering with charities, coupons, etc. Remember that you are a business that accumulates cash on site. Do not allow large amounts of cash to accumulate at your location. Keep enough cash on hand to make change, but make frequent trips to an offsite location such as a bank to deposit accumulated cash. Fence your lot to discourage theft and make sure you can lock the entrance and exit. A night guard is something to consider only if your lot is in an area where security may be an issue.